The clock is ticking! Take three minutes to stare at these elaborate color photos before time's up and you have to turn the page. On the flip side, you'll find questions about the various details in the picture. Can you remember what you saw? 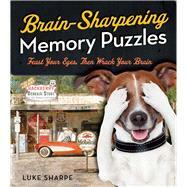 These 80 puzzles are a great way to test your memory, sharpen your recall, and have fun at the same time!